Authors: Gillon, M., Triaud, A.H.M.J., Jehin, E., Delrez, L., Opitom, C., Magain, P., Lendl, M., & Queloz, D.
Relative sizes of some bright stars in the Milky Way. 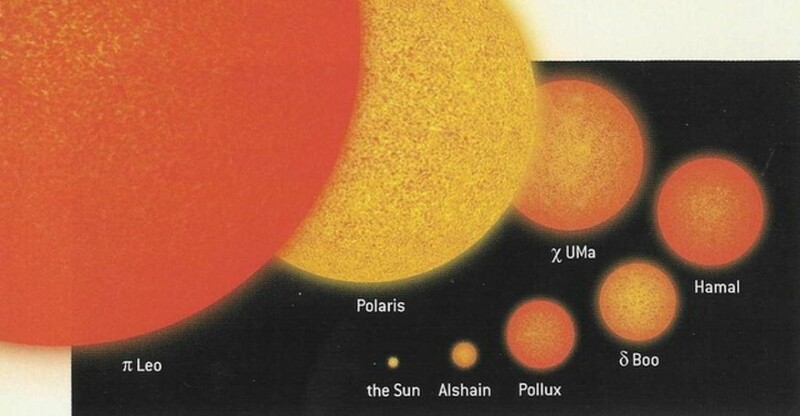 Most stars that can be seen with the naked eye from Earth are larger than Hamal (including the three giants shown here), but most stars in the solar neighboorhood are smaller and fainter than the Sun. When you look up at the night sky, there are thousands of stars that can be seen by the naked eye (Theoretically. This author lives in the Los Angeles area, where the actual number is closer to 15). You might expect that these “naked-eye” stars would be the closest stars to the Earth, but this is actually not the case. Because high-mass stars are so much more luminous than low-mass stars, the naked-eye stars you can see are mostly distant giant stars. This effect is called the Malmquist bias. Of the nearest 50 stars to the Earth, only 3 are more massive than the Sun and only five are visible to the naked eye! Our solar neighborhood is dominated by stars less than half the size of the Sun and less than 10% as bright. When we look out at night, the light we observe is dominated by light from massive, distant stars like the ones shown to the right. The solar neighborhood has been surveyed many times at visual wavelengths, in the near-infrared, and the ultraviolet, but because nearby stars can be so faint there can still be surprises hiding right next door. One of these surprises was announced last month. Using data from the Wide-field Infrared Survey Explorer (WISE), Kevin Luhman discovered an object with a very large velocity across the sky (astronomers call this proper motion), meaning it might be very close to our own Sun. Follow-up observations revealed the object to be a binary system, made of two brown dwarfs separated by only 3 AU, and measurements of its parallax place its distance at only 2 parsecs (6.5 light years)! So how was this system missed previously? Luhman searched for the binary in released datasets from previous surveys and found the object in four images taken between 1978 and 1999. In three of these four surveys, the brown dwarf pair happened to be very close to other, brighter objects, leading the binary to be missed (see figure below). Only with the WISE detection was the binary’s high proper motion recognized, allowing it to be “precovered” in these previous surveys. 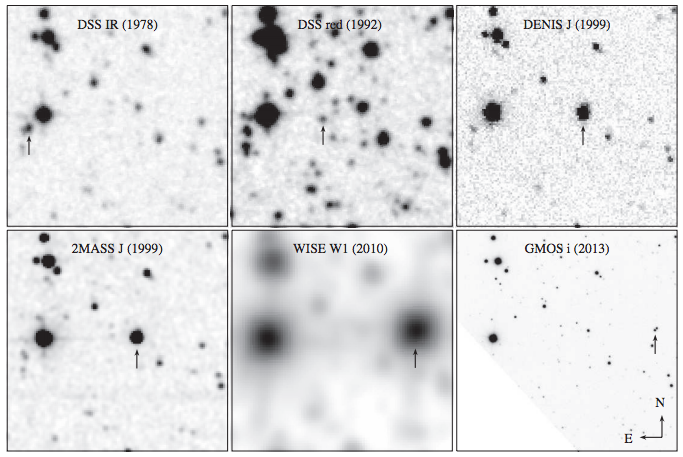 Figure 1 from Luhman 2013, showing previous surveys of the area near the newly-discovered binary. The arrow points to the location of the binary, showing the object was blocked by brighter objects in most images. The final frame reveals the binary nature of the brown dwarf pair. Light curves of Luhman 16 from two separate nights. A variable signal with a period of approximately 5 hours can be seen, suggesting at least one of the binary pair is rotating at that rate (Figure 1 from Gillon et al.). The discovery of any star system at 2.0 parsecs would be a cause for considerable study, but the smaller brown dwarf in this system is particularly interesting. Brown dwarfs are divided into three types, or spectral classes. In order of decreasing temperature, they are L, T, and Y. L- and T-dwarfs are differentiated, in part, by cloud cover; L-dwarfs are completely covered in silicon/oxygen clouds, while the cooler T-dwarfs have fewer silicates in their atmosphere and are not fully covered by opaque clouds, leaving their warmer surfaces visible. Brown dwarfs at the L/T transition have patchy cloud cover, leading scientists to believe as the brown dwarf’s rotation brings these clouds into and out of view, the observed flux from these stars can change by up to 20%, making the star appear variable. Since most brown dwarfs are extremely faint, this has been hard to test, but the fainter of the new binary pair (now called Luhman 16) is right on this transition, providing an excellent opportunity to test this theory by observing this new, nearby system. The authors observed Luhman 16 for a total of twelve nights with the 60-cm TRAPPIST telescope at La Silla Observatory, Chile. Some of their data is shown to the left. There is clear variability here! The authors use a periodogram to determine a rotation period of 4.87 ± 0.01 hours. The authors find the variability is best fit by a rotation model with only one period, suggesting the variability is from a single star in the binary pair. To determine which star is rotating to cause the variability, they then attempt to separately measure the light that is coming from each individual brown dwarf. They use a procedure known as aperture photometry, in which the flux is measured by adding up all the light within a circular aperture that is selected to enclose only the region of interest (in this case, a single brown dwarf). Background light, such as emission from distant, unresolved stars and galaxies, can contribute to the flux within the aperture, and this is generally accounted for by estimating the flux in a nearby “empty” region of the image and then subtracting it from the aperture measurement. In this case, since the two brown dwarfs are so close, they also need to subtract the contaminating flux from the binary companion. 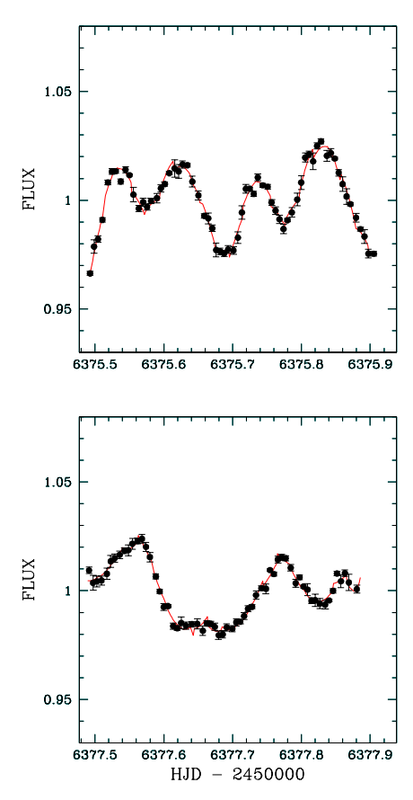 After separating the light from each star, they find the flux from the L-dwarf is approximately constant, but the T-dwarf is varying by up to 20%, explaining the observed variation in the original measurement. The authors conclude this star is probably at the boundary between an L and a T dwarf, where stars would be expected to have a system of patchy clouds. T-dwarfs are divided into ten subgroups, from T0 to T9; T0 dwarfs are closest to L-dwarfs, while T9 systems are very near the T/Y boundary. The authors of this paper call this star a T0 dwarf, right on the boundary between the L and T spectral classes. This star must be rotating once approximately 5 hours to cause the observed light curve, while the L-dwarf is probably nearly covered by clouds. Because the L-dwarf is not varying, the authors cannot determine its rotation rate. The first direct detection of a brown dwarf was only 18 years ago; like the study of exoplanets, this is a field that is evolving quite rapidly. This will only be enhanced by the discovery of Luhman 16: a brown dwarf only 2.0 parsecs away at the L/T boundary will be an extremely useful benchmark star for atmospheric modeling studies, models of brown dwarf evolution, and binary star formation. Since the announcement of the discovery of Luhman 16 three weeks ago, it has already been the subject of four papers. This will certainly become an incredibly well-studied object in the near-future; let’s hope our new neighbors don’t get sick of us looking at them! is it possible that this system harbors extrasolar planets? It’s certainly possible! Gillon et al. looked through their photometric data for planetary transits, and determined there were no transits caused by planets larger than twice Earth’s radius. However, it’s possible they just got unlucky and missed some transits (maybe they occurred during the day), or it’s possible that there are planets on wider orbits, so that 12 days isn’t long enough to detect a transit. Moreover, there have not yet been any searches for non-transiting planets using the Doppler method. Our current planet formation models allow formation of companions to brown dwarfs; this will certainly be an interesting target for future planet searches! Do we have diameter sizes for these two yet?